I won’t recount for you the whole story (see more here), but Ben Witherington III stumbled upon a treasure trove of unpublished material by J.B. Lightfoot while Witherington was on leave in Durham (UK). Some of this material, all handwritten, was Lightfoot’s personal lecture notes on Acts. Witherington, with help from others including Todd Still, made the worthwhile effort to publish this material. 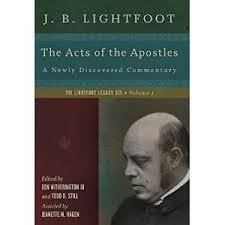 The first volume in a series called “The Lightfoot Legacy” is entitled The Acts of the Apostles: A Newly Discovered Commentary (IVP, 2014). Before cracking the spine on this book, I had already told a friend I was excited about this publishing endeavor because Lightfoot was such a supreme model of a historian, somehow with encyclopedic knowledge of ancient texts and languages. In a time now when seminaries are cutting biblical languages out of their curricula, I admire the “good ole days” when historical study (including original languages) was simply taken for granted as foundational to proper study of Scripture. Having now read a good bit of this newly published work, I enjoyed the early biographical sketch written by Witherington and Still, getting to know Lightfoot the person. Actually, when I was a student at Durham a handful of students had a rare and memorable opportunity to visit Auckland castle where we were treated to a tour of the facilities including the place where Lightfoot and Westcott were buried. What a great legacy at Durham of top-notch historical work. A caveat – Lightfoot’s Acts notes are quite technical, so not casual reading. Lots of insights and great material for research, though, of course. One additional note: Lightfoot was a pious man (obviously an advantage for a bishop!). While he excelled as a historian, his study was deeply rooted in faith. I was blessed by this statement on prayer and exegesis. I appreciated Lightfoot’s works though it is more older–sounds like an interesting find by BWIII! Would love to read his biography on Lightfoot one of these days!